Have you ever been surprised by something you didn’t see coming, then after a more detailed review, you know you should have seen it? You noticed signs—small cracks—but you didn’t pay attention to them. At the time, they seemed minor, and you were too busy to spend energy checking on them. Then these cracks grew and, before long, you had to spend considerable time and energy dealing with them. Hence, a vicious circle ensues as you get too busy to spend time on other minor cracks that surface. Constantly be on the alert for cracks in your organization, then deal with them immediately. What seems innocent and tolerable today may lead to bigger cracks or problems in the future. A little lie you let someone get away with today may be a crack that could turn into a bigger, more damaging lie. A small indiscretion you ignore today may be a crack that leads to a major law suit. A minor conflict today that doesn’t get addressed may become a stifling organizational silo. A minor non-performance issue today may indicate large, non-performance issues are on the horizon. An unexpected resignation from a key employee to work somewhere else may be a crack that ends up with unwanted turnover. 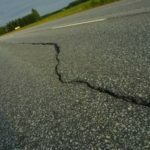 Recognizing cracks early and then taking responsible action are the solutions for these (and other) cracks you identify. Don’t wait!